Back again with another two episodes from season six. The former a good resolution to Maybourne’s character arc while the latter is a generic filler episode. We start at O’Neill’s house where his attempts to enjoy a day off is interrupted by the return of old friend/pain in the arse Maybourne who has come to buy his way into a Presidential Pardon by offering the team the address to a planet that contains a cache of Ancient weapons, the same one Simmons hijacked the Prometheus to try and nab. O’Neill refuses to help initially but Maybourne calls his bluff as the chance to gain weapons to use against Anubis is too big to pass up. O’Neill brings the proposition to the SGC, where Hammond decides to have the team explore the planet to check Maybourne’s story which they confirm via the presence of a coded interface. Upon return to the SGC they have Maybourne brought to the facility and while O’Neill doesn’t want to bring Maybourne, knowing he’ll do something, he doesn’t have a choice as only Maybourne has the code to unlock the interface. Upon return to the planet they return to the interface where Maybourne enters a code before immediately zatting and running through the portal that opened, with O’Neill managing to grab hold of him and follow him through leading the two of them to a serene-like world which Maybourne claims is a Utopia designed by an advanced race that is safe from the Goa’uld and Maybourne was hoping would be a new chance for him. What they find however is a long abandoned set of primitive huts and long decomposed bodies leaving the two men stranded on a planet with seemingly no way off and no shelter. While O’Neill holds out hope for rescue Maybourne takes a much more pessimistic view, believing that whatever hides the sanctuary from the Goa’uld also hides it from their friends. At the portal entrance Carter is growing more desperate in her attempts to find a solution to their predicament, with the Tok’ra unable to help and other SGC scientists believing the situation is hopeless and noting that Carter’s command is becoming unstable. She also requests from Hammond the delivery of a satellite and launch system despite the extreme cost of doing so which is understandably turned down by Hammond. As the weeks go on Carter becomes more and more effected by the loss of another team member to the point where she may no longer be able to cope with the job. At the sanctuary things become tenuous as Maybourne starts to lose his mental faculties over time, demanding that O’Neill give him a weapon to defend himself from whatever is making the noises in the forest. Worried about his friend’s growing instability O’Neill buries the more dangerous parts of his equipment nearby. Over the next couple of weeks both men begin to lose their minds and actively avoid each other, with Maybourne going substantially more native than O’Neill has. While counting the bodies in the woods (finding a dead symbiote amongst them) O’Neill triggers a grenade trap set by Maybourne before shooting at what he sees as a boar but is actually Maybourne, who is now armed with O’Neill’s P90. O’Neill works out finally that it’s the plant that they’ve been eating that’s making them paranoid. Back at the SGC Carter and Jonas finally make a break through, realising that while in the original footage before they opened the portal there was a near moon in the sky while now it has disappeared, showing that the location of the sanctuary was obvious all along. The reveal of the location comes not too soon for O’Neill and Maybourne at the sanctuary, with Maybourne launching a final assault on O’Neill and getting shot for his trouble. With the two of them finally seeing their heads cleared of the effects of the drug they finally make their peace with each other moments before they’re rescued by the Tok’ra, with O’Neill promising to have the Tok’ra take Maybourne to a planet where he can retire in peace without fear from the NID or other threats. As an episode Paradise Lost isn’t one of the grandest or the most out there but it’s still a fun little piece that explores one of the best relationships on the show while having a small twist that’s very well-played. The main thrust of the episode is seeing O’Neill and longtime friend/adversary Maybourne trapped on a planet with nothing but each other for company. While at first this doesn’t go too badly, with Maybourne surprisingly happy for a change, it soon takes a turn for the worse as it turns out the apparent paradise is nothing but a pipedream with everyone dead from an unknown cause. Over the episode both are slowly driven insane by tainted plants on the planet, likely left there by the Goa’uld for that exact purpose, seeing each other as wild beasts that need to be killed. While O’Neill is able to retain some of his mental abilities, having eaten less of the plant, his companion is less fortunate and by the end looks more like a character from Apocalypse Now than the seasoned and intelligent former NID officer we know he is. Out of the two of them Maybourne has the more interesting character arc in the episode. While before now his interactions have always seen himself happy to manipulate others for material gain here we see that beneath his charming exterior he’s a man worn out by the constant status of being on the run and just wants a new start, believing that he doesn’t have a chance at one on Earth. It’s likely the collapse of this dream that helps quicken his descent into madness at the hands of the plant, becoming miserable and believing that something is out to get him. By the end however he’s finally given his chance at a new start, with the Tok’ra taking him to a new world. The character arc that makes the least sense is probably that of Carter. While Carter has become emotional in the past at the loss of friends the fact she loses all sight of the nature of the work they do is a bit hard to believe, with her demanding a satellite launch of all things to take place on the planet. While it’d make sense for her to be effected by the loss of another team member the complete falling apart was something that didn’t make sense. Overall the episode is an enjoyable one, ending a long-running arc on the show and giving a character who earnt his redemption the pay off he was due. · I did like how they drained the colour out of the screen when focusing on characters being under the influence of the drug. The episode begins in the SGC, with Jonas and Carter discussing his attempts at flirting with a nurse in the infirmary before being interrupted by the arrival of the Russian SG team who have broken protocol by bringing an off-world human along with them. The man they brought tells them that Nirrti is experimenting on humans at an off-world location using a machine to try and create another advanced human host. Before he can reveal much further however he suddenly starts experiencing severe pain and turns into liquid. Given the obvious threat to other lives SG-1, SG-3, and the Russian team are all sent back to the planet to stop Nirrti. Arriving on the planet the teams make short work of Nirrti’s Jaffa forces and SG-1 manage to infiltrate her palace. There they discover other humans who have been disfigured by the experiments performed on them but refuse to accept the help of the others, claiming that Nirrti is helping them as they’re sick. 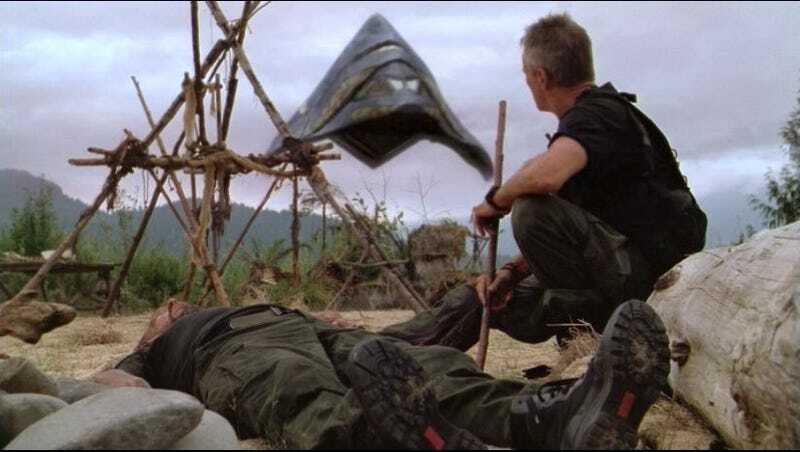 The team however are betrayed by the modified humans, who display powers such as telekinesis and mind-reading, after they see that SG-1 are there to kill Nirrti and feel responsibility for what has happened to the humans on the planet. Now trapped the team try to convince the other humans to free them to no avail, instead only helping Nirrti experiment on them, starting with the leader of the Russian leader Evanov and then Carter. Later when Jonas is chosen he attempts to overpower his captors but is quickly stopped by their powers. While Jonas is out of the cells Evanov suffers the same fate that befell the man he brought through the Stargate to the SGC. When Jonas finally awakens from his testing he finds himself inside Nirrti’s quarters where upon she tries to seduce him to work with her but he declines, only to be sent back to the cells with the others. Before being brought up for testing himself O’Neill attempts one more time to convince the other humans to help them. While this appears unsuccessful the mind-reader sees that Nirrti is in fact hurting them while the telekinesis one deals with her guards before snapping her neck. While O’Neill initially fears this means they’re all doomed to die from the experiments the altered humans now have the knowledge to fix everyone before destroying the machine so that it can never harm anyone again. Metamorphosis is an episode. It lasts around 50 minutes. Outside of those two statements I really don’t know what to say about the episode in question. While it tries to reinvolve the evil that is Nirrti it doesn’t really hold together in my view, instead being a mess of slurred monstrous humans taking the team to and from a torture chamber and a Russian once again dying. While the prosthetics used in the episode are good and it has a couple of good action sequences early on it just still looks quite bizarre and a rather cheap episode compared to many others this season, putting it simply as one to fill out the order than to have a lasting effect and one of the few honestly bad ones of the later era of the show. Overall it’s an episode that is sunk by a poorly thought out plot and villain that can’t be saved by a few explosions and prosthetics. · I wouldn’t want to be a Russian on this show that’s for sure.